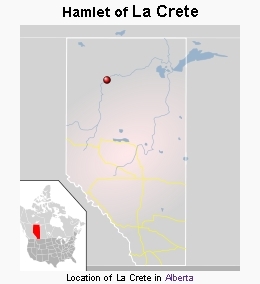 La Crete, Alberta is a predominantly Mennonite community with a population of 2,039 in 2003, more than double its 1995 population of 995. La Crete also acts as the hub for more than 5,000 rural residents in the area. It is located 400 km. north of the town of Peace River and 800 km. north of Edmonton (coodinates: 55° 10′ 0″ N, 114° 24′ 0″ W). Old Colony Mennonites from the Hague-Osler areas in Saskatchewan began moving to the Peace River area of Alberta in the early 1930s. They were disturbed by the increasing worldliness around them and chose to move to the isolated area of the lower Peace River country. Three Old Colony families settled in Carcajou, about 180 km. north of the town of Peace River, in 1932, and by 1934 they had been joined by 12 families. In 1936 some of these families began resettling in the area of La Crete and Buffalo Head Prairie. Others from Carcajou followed, as did friends and relatives from Saskatchewan and Manitoba. They were also joined by Old Colony Mennonites that had initially immigrated from Canada to Mexico in the 1920s before returning to Canada. By 1939, 40 Mennonite families totaling approximately 240 people were living in and around La Crete, and by 1951, the population had grown to more than 450, of which 99% were Old Colony Mennonites. The settlers were initially served by Elder Johann Loeppky and other leaders from the Hague Old Colony Church. The first minister to settle in the area was Isaac Wieler, who arrived in 1938 from Hague, Saskatchewan. On 29 June 1939 Isaac Hiebert and Cornelius Krahn (d. 2000) were ordained as ministers and Abram Bergen (d. 1961) as deacon. On 9 October 1941 Wilhelm P. Wiebe (d. 1977), who had been ordained as a minister the previous year, was ordained as elder of the church at La Crete. John Klassen succeeded Wilhelm P. Wiebe as elder of the church on 18 June 1978. The first church building was the Reinland church in La Crete, dedicated on 5 July 1951. A 20 foot addition was added in 1963, and a new church building dedicated on 26 September 1982. Church services began in Blumenort in 1952, with a new church building dedicated on 26 August 1984. The Buffalo Head Prairie (Rosenfeld) church building was dedicated on 3 November 1957, with an addition built in 1974, and a church building was dedicated at Tompkins Landing (Neuanlage) on 29 June 1986. Other ministers who have served the church included Cornelius Giesbrecht, who moved to the area from British Columbia, Isaak T. Goertzen and John K. Peters, both ordained as ministers in 1955 (both later moved to Bolivia), Jacob J. Froese, who died in 1993, John J. Wolfe, Jacob W. Wiebe and Abram Wieler, all ordained to the ministry in 1961, Jacob T. Wiebe and Herman Giesbrecht, both ordained to the ministry in 1971, John Klassen, elected as a minister in 1975, John Wassen, Herman Friesen, John T. Wolfe, elected in 1976, Jacob Schapansky, ordained in 1978, and John Harms, Peter Giesbrecht and Peter Fehr, elected in 1995. The Old Colony Church at La Crete has close ties with the Old Colony Mennonite Church at Vauxhall, Alberta, and with the Sommerfelder Mennonite Church in the La Crete area. Most children attend public schools, with some attending private schools run by Old Colony members in Tompkins Landing and in Buffalo Head Prairie. Most of the children attending the public schools also attend German school operated by church members on Friday and Saturday nights. Many Old Colony Mennonites in the La Crete area moved away throughout the 1960s. In the previous decade, other Mennonites had moved to the area who were more open to modernization and public education. This was unsettling to many Old Colony families, and they felt that it was time to move on. In 1959, 30 families moved 300 km. southwest to Worsley, an isolated area beyond the boundaries of existing school districts. Between 1960 and 1962, approximately 35 families moved to British Honduras (now Belize), where it was perceived that education was not stressed. Developments in education that were perceived as negative by Old Colony Mennonites persisted throughout the 1960s. Old Colony school board members were replaced with non-Mennonites, one-room public schools that had been replaced by private German-language schools, were closed, and by 1967 children were being bused to two large consolidated schools. Rumors of the introduction of sexually explicit material in to the elementary school curriculum, which were without foundation, were enough to encourage a significant number to leave La Crete. The education issue was compounded by the establishment of two Sommerfelder churches and one Bergthaler church, and the rise of mission activity by Mennonite groups among the Old Colony Mennonites. In 1967 a delegation of men from La Crete traveled to Bolivia in search of a large tract of land in an isolated area. 2,000 acres were purchased, with options to purchase more land in the future. By July 1967, two groups of Old Colony Mennonites, totaling 102 persons, flew to Bolivia. Additional families followed. More than half were from Worsley, but at least eight families were from La Crete. Others, including Minister Isaak T. Goertzen, immigrated in 1968, and by the end of 1969, approximately 300 Old Colony Mennonites from the La Crete area moved to Bolivia. About half of these people had been living in the Blumenort area. 1970 saw 30 additional people from Blumenort join the settlers in Bolivia. Immigration of Old Colony Mennonites from the La Crete area continued after 1970, but at a much slower pace. Most of the former La Crete inhabitants eventually settled in the Las Piedras Colony, and later in Las Piedras II, but by 2000 former residents of La Crete were living in at least eight colonies in Bolivia. Not all who moved to Bolivia stayed. Several families returned to La Crete within a year of their move to Bolivia, and others continued to return to La Crete for a variety of reasons, including climate, harsh living conditions, illness, and the strictness of life on the Bolivian colonies. During the 1980s, the return of families to La Crete increased as jobs became available in logging, sawmill work, trucking, and construction. Another reason was the opening of approximately 50,000 acres for agricultural settlement in the Blue Hills area, southwest of La Crete, between 1980 and 1984. The return of people from Bolivia to La Crete intensified after 2000. In the summer of 2002, it was reported that the population of the La Crete area had increased from 6,000 to 7,000 in one year, with most of this growth attributed to the return of Old Colony families from Bolivia. The total size of the church in 1987 was 2,163 (including children) while in 2000 the membership was 1,031 with a total of 2,300 attending. The church was served by seven ministers and 20 deacons, along with the elder. Besides the four church buildings, services were also held in the La Crete Long Term Care Home and in the Seniors' Lodge in La Crete. The language of worship was German and Low German. Bowen, Dawn S. "Migration and Its Impact on La Crete, Alberta." Journal of Mennonite Studies 22 (2004): 59-82. Canadian Mennonite (9 November 1965): 8. Gutsche, Horst W. "Verzeichnis deutschsprachiger Gemeinden und Seelsorger in Kanada." March 2010. Web. 23 February 2012. 1.pdf http://www.uwinnipeg.ca/index/cms-filesystem-action/pdfs/german-cdn/101217-1.pdf. Loewen, Robert. "La Crete Old Colony Mennonite Church." Old Colony Mennonites in Canada: 1875 to 2000, edited by Delbert F. Plett. Steinbach, MB: Crossway Publications, 2001: 156-158. Thiessen, Richard D. "Old Colony Mennonite Church (La Crete, Alberta, Canada)." Global Anabaptist Mennonite Encyclopedia Online. February 2012. Web. 22 Apr 2019. http://gameo.org/index.php?title=Old_Colony_Mennonite_Church_(La_Crete,_Alberta,_Canada)&oldid=142517. Thiessen, Richard D. (February 2012). Old Colony Mennonite Church (La Crete, Alberta, Canada). Global Anabaptist Mennonite Encyclopedia Online. Retrieved 22 April 2019, from http://gameo.org/index.php?title=Old_Colony_Mennonite_Church_(La_Crete,_Alberta,_Canada)&oldid=142517.